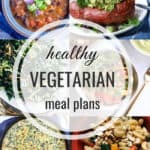 Save time and money by planning ahead with this weekly Healthy Vegetarian Meal Plan, grocery list included! Most recipes are gluten-free and vegan-friendly so it’s a win-win. Sunday Chickpea Frittata from Making Thyme for Health Prep Ahead Tip: Veggies can be chopped in advance to help save time. Vegan/Gluten-free Substitutions: Recipe is vegan and gluten-free. Monday Spring Veggie Bowls with Cilantro Lime Crema from Hummusapien Prep Ahead Tip: Veggies can be chopped ahead of time…. 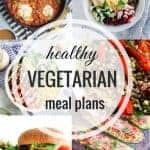 Save time and money by planning ahead with this weekly Healthy Vegetarian Meal Plan, grocery list included! 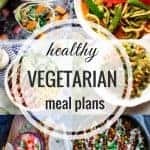 Most recipes are gluten-free and vegan-friendly so it’s a win-win. Sunday Swiss Chard Mushroom Enchiladas from Making Thyme for Health Prep Ahead Tip: Enchiladas and crema can be prepped up to 2 days in advance (without topping them with sauce) then baked when ready to serve. Vegan/Gluten-free Substitutions: Recipe is vegan. Use gluten-free tortillas to make GF…. Oh HAY! I’m Alexis, a Registered Dietitian, food blogger, and restaurant extraordinaire. I use my passion for cooking and wellness as fuel to help others ignite a more freeing, happy, and wholesome relationship with food. Learn more! Hummusapien Home: A Bathroom Update!